which can help prevent minor mouth infections. Its local anaesthetic action acts quickly to relieve pain and soothe sore gums. Its sugar free formulation is ideal for infants and young children. Bonjela Teething Gel is specially formulated for infants from 2 months to provide relief from teething pain. Use: Gum astringent gel for spongy, painful and bleeding gum. HiOra-GA Gel address gingivitis of various etiologies. Packaging Size: 10 gm Lammi Tube with Carton. Inhibition of formation of dental plaque As an aid in the treatment and prevention of gingivitis. As an aid to maintaining oral hygiene. For use in a post-periodontal surgery or treatment regimen to promote gingival healing. It is useful in the management of recurrent aphthous ulceration. It is useful in the management of recurrent oral candidal infections. We offer our clients an exclusive range of No Sores Gel. Yashtimadhu: It is an excellent wound healer, reduces burning sensation and pain. Arimedadi tel: It useful in mouth ulcers, tooth carries and infections. Kankola: It helps wound heal and also good for dental problems. Khadir (Acacia Catechu Willd) : 134 mg.
Irimed (Acacua Fernesiana): 134 mg.
Tagar (Valeriana Wallichi): 3.2 mg.
Rasana (Pluchea Lanceolota): 1.6 mg.
Kushtha (Saussurea Lappa): 4.8 mg.
We prefer business from India only. 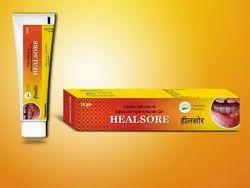 Smyle Mouth Ulcer Gel is India's No.1 Ayurvedic Mouth Ulcer Gel. Due to its astringent & anti-inflammatory properties, Smyle Mouth Ulcer Gel provides instant relief from mouth ulcer pain.It also provides antiseptc & deodorant properties. GC Dry Mouth Gel is designed to ease the symptoms of dry mouth for patients who may be suffering from impaired production of saliva due to medications, radiation treatment or diseases that can damage the salivary glands. This product provides a protective coating for teeth and oral tissue. - A water soluble root canal cleanser gel containing 17% EDTA with 10% carbamide peroxide.